Our kitchen groups & the West/Aux space are powered by the fusebox in the dirtyroom behind the left tall fridge. In the event of an outage, check there first. This fusebox is powered from the downstairs Urban resort fusebox, NOT the fusebox on this floor level. If a fuse blows there, you need to contact Urban resort (and wait for Urban resort to replace it, which may well mean "office hours"!). 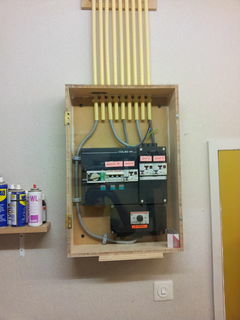 For all matters regarding this fusebox, please contact Ultratux, justa, Remko, or a board member. From left to right, there are 4 groups, each group consists of two switches; A Ground Fault Switch/Breaker, and a 'fuse'. More on that below. Group X => three-phase group only used in the dirty room for special three-phase equipment. Group 1 => powers kitchen group 'yellow', including dishwasher and (close-in-) water boiler. Group 2 => powers kitchen group 'green', this one should preferably be used to hook up most coffee makers, tea kettles and the like. First off, we are powered by 3x16A because the feed cable is rated for only that; this presented us with a problem, since we also need to use 16A fuses, otherwise many power-hungry devices might trip our 10A fuses too often. We have chosen a middle ground: we deploy 13A fuses. This means that the fuses blowing in our own (accessible) fusebox has a only-slightly better chance than the fuses blowing in the (inaccessible) fusebox of Urban resort. We have to await what the day to day practice shows. The electrician did inform us that, by their nature, the fusibles downstairs will trip much slower in the event of a short than our fusebox breakers. However, in the event of an overload, as opposed to a short, there is no telling whether our side blows first, or theirs. In the meantime, we've had numerous overload situations, all caused by overusing kitchen equipment, and all of those times the fuse on our side blew, not the one in Urban Resort's fusebox, so that is good. The fact we used so much cooking equipment to cause to blow them, otoh, was not good. I have planned to make a little box with a couple of leds that show whether all three phases are available. The box came from AliExpress. Sadly, unknown to me at the time, it is not rated to be connected more than 2 minutes. This is a setback, I wanted 3 LEDs so they could be monitored continuously. I'm still pondering on a solution. This may be instrumental to ascertain whether a fuse at Urban resort has blown or not. About the aforementioned two switches per group; one (the narrower one) is a 13 amp 'fuse'. The wider one (with the brown buttons) is a combination of GFS and 16 amp fuse. The latter one cuts both phase and return conduits, so it is a breaker. The narrow 'fuse' IS NOT a breaker !! seconds to couple of minutes) of being overloaded. Make sure that there is no cooking, coffee making, tea making and no running dishwasher or vacuuming at the time you use the machinery. Ask members to consider waiting a moment. Especially try to make sure to avoid blowing a fuse if it will impact a big public event following it or under way. If the machine or equipment has not ever been used before at our place, please consider doing the first test during UR business hours. If we all follow these suggestions we can ensure that the risk to inconvenience other members gets minimized, or eliminated altogether. This page was last edited on 24 June 2017, at 00:53.